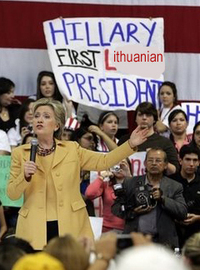 If the case can be made that Distinguished Former President William Jefferson Clinton was the first black president, then I'd like to make the case for Hillary as America's First Lithuaniac President. Not only does she continue to use her clothing and jewelry to send signals to certain interest groups, but her physical appearance is one continuous salute to the Lithuanian-American voter. In the same way that pasta makes the heart of Italians beat faster and lutefisk continues to hold a certain power over Finnish-Americans, there are certain foods that make the Lits glow and Hillary doesn't miss a one of them. Kapusta Power to the people! 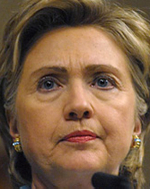 Not only does she have a cabbage-shaped head, but she often styles her hair into a tribute to boiled cabbage leaves. 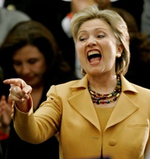 In this photo, we get a 2-for-1 as HRC does her crowd-pleasing imitation, the "herring face". The preferred foodstuffs of the Lithuanian-American community is anything that is white, cheap and greasy. 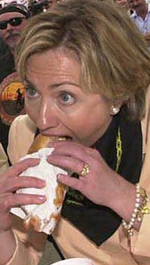 Here is our gal Hill missing the message by trying to consume a paper napkin that fits the definition. 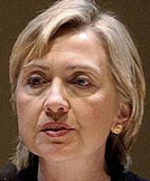 Derived from the capitol city of Lithuania, her Secret Service code name is "Evilnius"
She lives in constant worry of being swallowed up by enormous nearby entity waiting in the shadows for another chance to dominate. Crushing the tender heart of Lit-Am sportsfans by outdoing beloved quarterback Johnny Unitas by displaying her full back. Has sympathetic affinity for Perkunas, the Lithuanian god of thunder(thighs). It's no coincidence that in Baltic mythology, Perkunas was pulled forward by a Billy goat. So there we have it - I think the latinas are going to have to get in line if they want HRC to be the first latina President. She's busy with the Lits.